Al Gore, among others, has been promoting a carbon tax based on bogus data showing carbon causes golbal warming. To my knowledge, Bloomberg is the first person to suggest a carbon tax as a way to battle terrorists. Bloomberg, a billionaire, got his start by gaining access to the “inside quote” that Primary Dealers used who traded with the Federal Reserve. He sold his quote machines to bond dealers with this quote. The quote was extremely valuable in providing bond traders with insight on Fed trading activities. It is not publicly known why Bloomberg was given access to this quote. Other quote providers who requested to publish the quote were denied access. 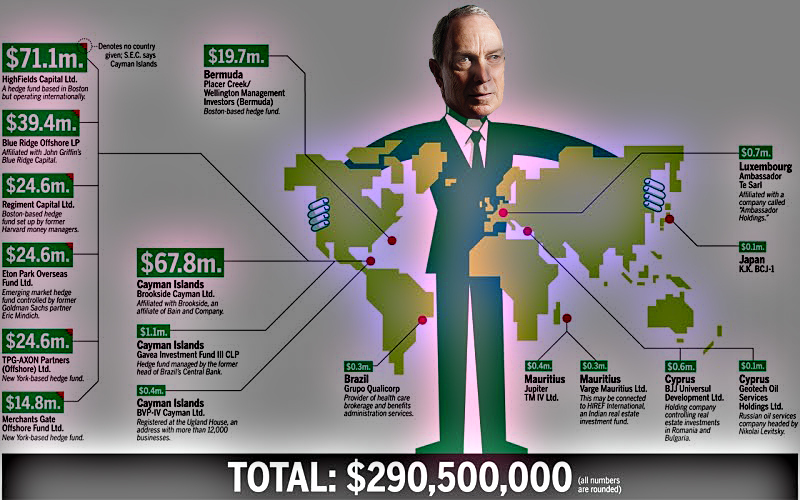 In short, it was a billion dollar gift to Bloomberg. Many view a Cap and Trade carbon tax as a gift to Wall Street firms such as Goldman Sachs, who are gung ho about trading carbon credits. His Secret Expatriation Of U.S. Currency! ← U.N. Sham Wow Cancun Climate Summit: Plunges To 100-Year Record Low Of 54° F.